WASHINGTON, July 22, (AFP) - Al-Qaeda founder Osama bin Laden is alive and sheltering in parts of Pakistan on the border with Afghanistan, US intelligence chief Mike McConnell said Sunday. McConnell blamed the Pakistani government of President Pervez Musharraf for allowing Al-Qaeda to regroup through a controversial peace pact last year with tribal leaders in the border areas. But Musharraf remains a key ally, he said. WASHINGTON, July 22, (AFP) - Pakistan's government lashed out Sunday after US officials said Al-Qaeda was regrouping on Pakistani soil and refused to rule out unilateral strikes against the extremist group's bases. “Pakistan's commitment cannot be doubted by anybody, and that is why some of our people do not like what we read in some of your newspapers, which are more like leaks and calculated leaks,” Foreign Minister Khurshid Kasuri told CNN. Instead of intelligence estimates, the United States should give Islamabad “evidence, actionable intelligence” on the Al-Qaeda presence inside Pakistan, he said. “Let the United States provide us with actionable intelligence, and you will find that Pakistan will never be lacking,” Kasuri said, attacking US media criticism “despite all the sacrifices that Pakistan has been making”. A new report by the US intelligence community last week said that Al-Qaeda had regrouped in its Pakistani “safe haven” on the Afghan border, and was determined to inflict mass casualties through new attacks on the United States. 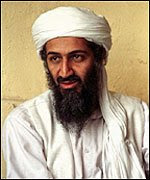 ISLAMABAD, July 22, (AFP) - Pakistan Sunday denied a US claim that Osama bin Laden is in the country's tribal areas, saying that if Washington knows the Al-Qaeda leader's whereabouts then it should inform Islamabad. US intelligence chief Mike McConnell told American television on Sunday that he believed bin Laden is alive and sheltering in parts of Pakistan on the border with Afghanistan. American assertions that military action remained an option to quell militants in Pakistan's frontier regions drew mounting protests from the government and its critics here on Monday, as clashes continued in the tribal areas where the United States says Al Qaeda has been allowed to set up a safe haven. The administration's homeland security adviser, Frances Fragos Townsend, said Sunday in an interview with Fox Television that the United States would consider military strikes against Qaeda hide-outs in Pakistan. The statement was promptly countered by the Pakistan Foreign Ministry spokeswoman, Tasnim Aslam, on Monday. "We do not want our efforts to be undermined by any ill-conceived action," Aslam said, adding that any military strikes would be deeply resented in the tribal areas and the rest of the country. Newspaper editorials over the past several days have pointedly criticized American suggestions of military action, taking note of American troops getting "bogged down" in Iraq and Afghanistan. "So in their own interest and in the interest of Pakistan's battle with the Taliban," read an editorial recently in Dawn, an English language daily newspaper, the Americans "better keep themselves out of it." In Washington, the White House tried to temper such concerns, saying that reserving the option of military force was not necessarily the same as exercising it. "I think there has been this notion afoot, or at least an attempt or an inclination somehow, we're going to invade Pakistan," said Tony Snow, the White House spokesman. "We always maintain the option of striking actionable targets, but we also realize that Pakistan is a sovereign government and a very important player in the war on terror."